Keeping Up With The Souths: Chhhiiiiieeeefffffssss! 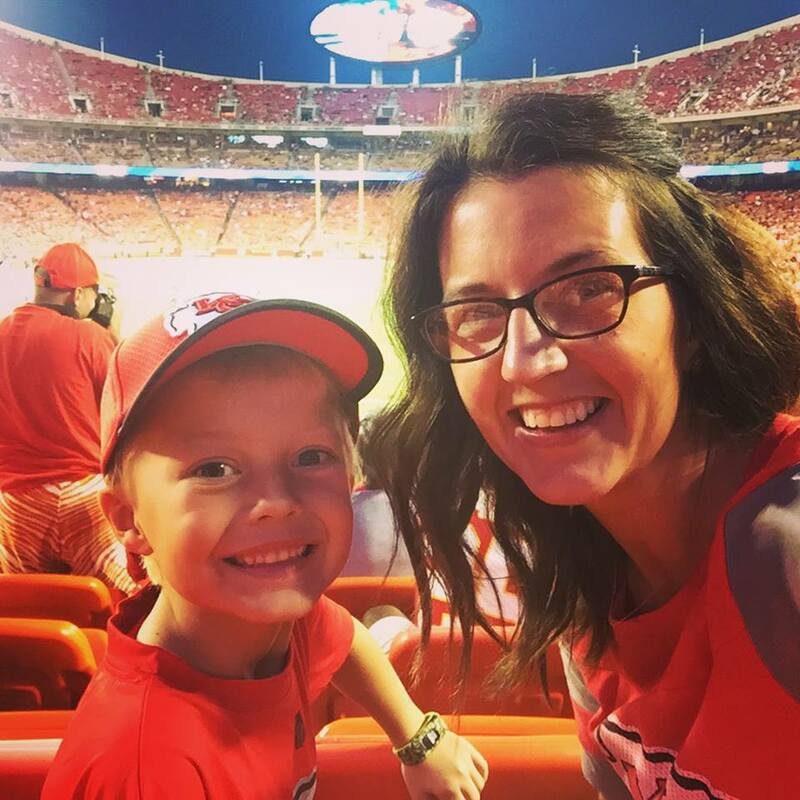 When we saw that the Chiefs were playing their final preseason game on Kaden's 8th birthday we knew this was the perfect opportunity to introduce the boys to a Chiefs game at Arrowhead Stadium. 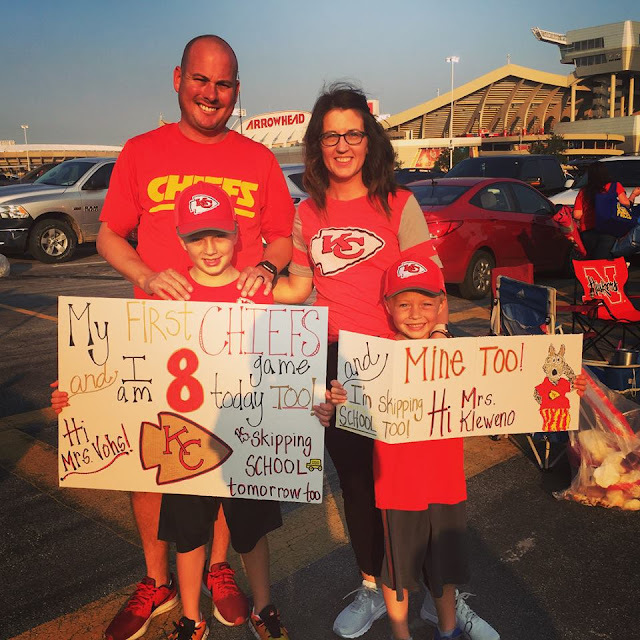 We've been wanting to take them for a number of years to a game but the crowd at Arrowhead is a little rowdier than the crowd at Kaufman--so we waited until the boys got a little bit bigger & we weren't so worried about the language they would hear. It also helped that this was the 4th and final preseason game which meant that the starters wouldn't play at all and attendance would be on the low side. Sure it's a school night & the teachers might not be too excited to learn the boys were out super late & may be extra tired at school so we put a plan together for that too. They were going to get to skip school on Friday! We picked up a little Joe's KC before heading out to the stadium where we met up with Grammy and Craig. We tailgated long enough to finish our food and throw the football around a few time before Justin and I thought it would be best to head in and get a little closer to the field for warm-ups. We found our seats relatively easy and then the boys asked if they could go down lower and since there weren't many people in the stadium yet we said yes. 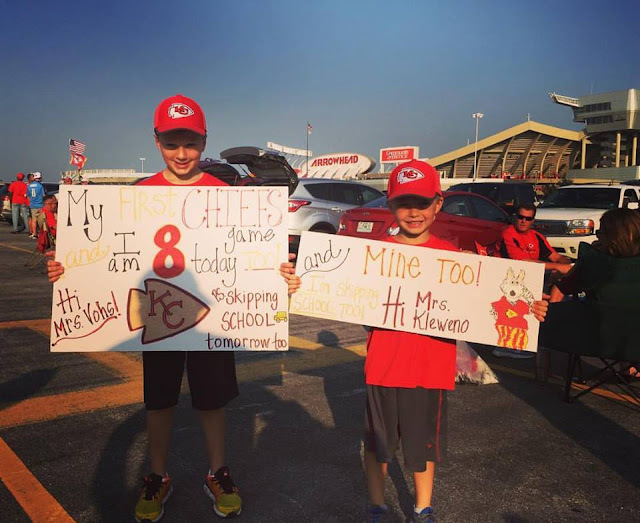 & they stood there holding their signs watching the Chiefs players run drill after drill. 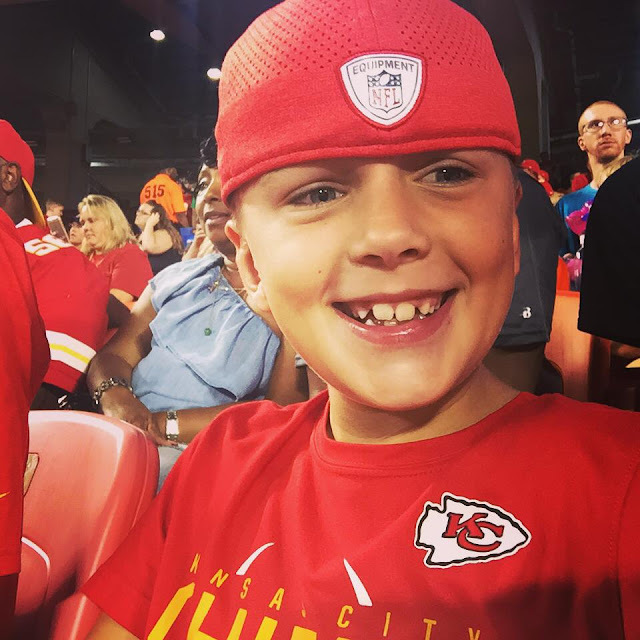 Kaden picked out Travis Kelce and Alex Smith. Justin pointed to a few others. The boys were amazed at how BIG some of the players were in person vs. what they seem like on TV. We stood there for about 15 minutes and watched a number of fans & pee-wee football players walk by us on the sidelines. I made a comment to Justin about how cool it would be to be down there and wondered how one would get that opportunity. Next thing I knew a wonderfully nice gentleman walked by and read Kaden's sign & two minutes later he showed up and handed us a pass to the field. 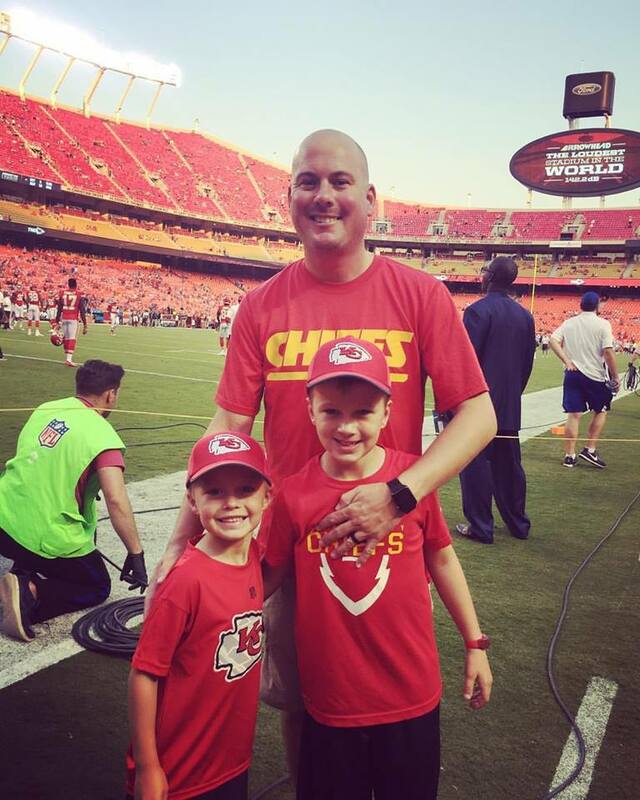 We showed our pass at the gate and on the field we went. 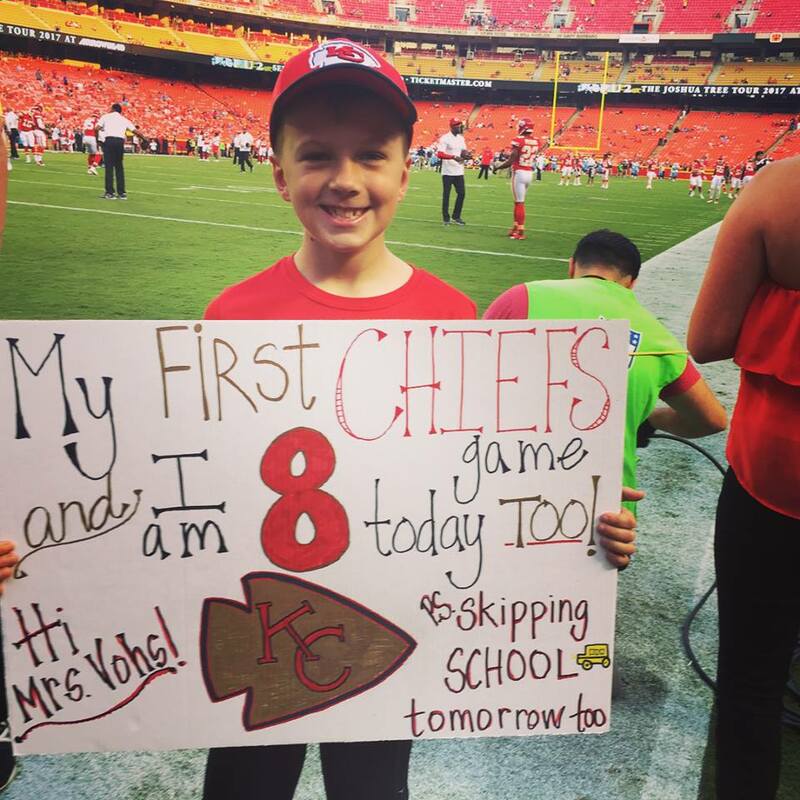 Talk about making a kids 8th birthday--he was on cloud 9. & so was his dad. We only got to stay on the field for a few minutes before they were ushering us off but the night was already made. 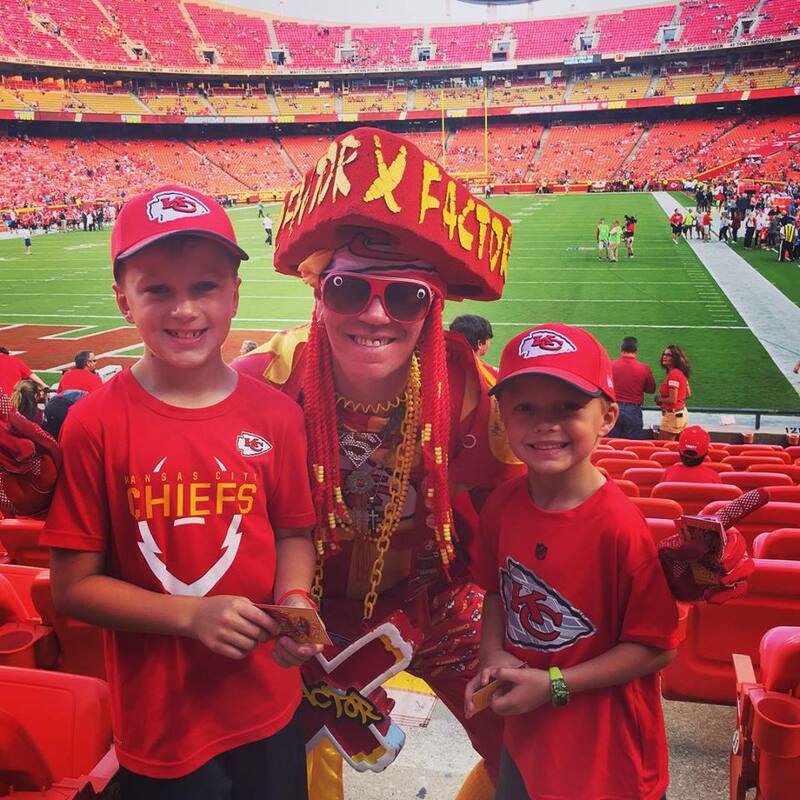 On the way up to our seats we ran into the X Factor---kids thought he was so cool and had to have their picture taken with him. He even gave the boys his very own "football trading card". It was a little weird. We quickly found our seats after having ran into him & enjoyed the pregame show---which is nothing like it use to be when I was a little girl. The boys were having a blast and had lots of questions about the game of football which Justin and I were happy to answer. They were full of smiles the entire time. 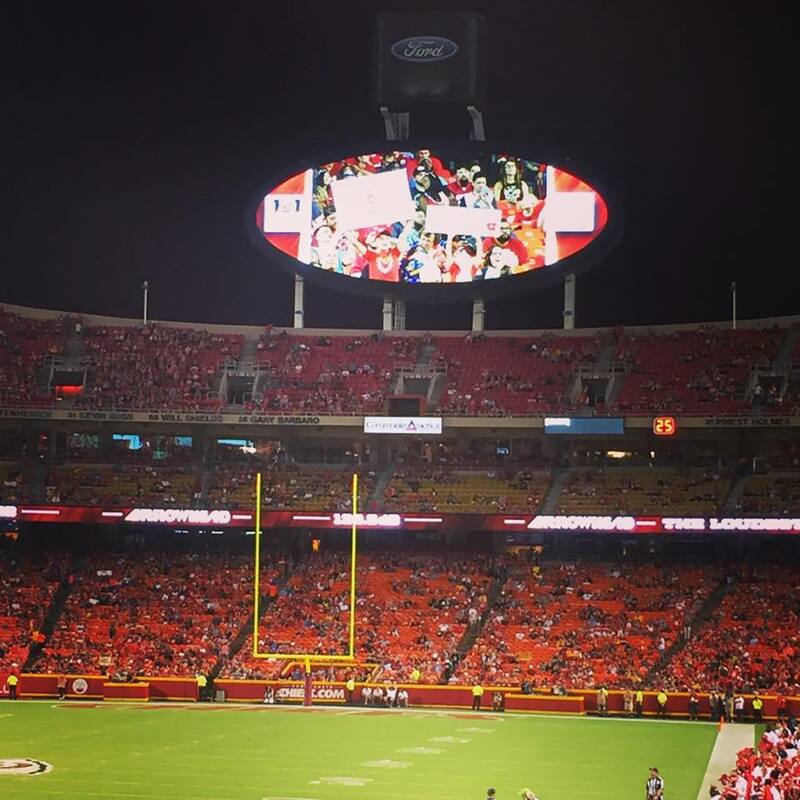 They even made it on the jumbo-tron which is ALWAYS a goal of theirs. And on the way out---we left at halftime---we jammed with the Rumble. 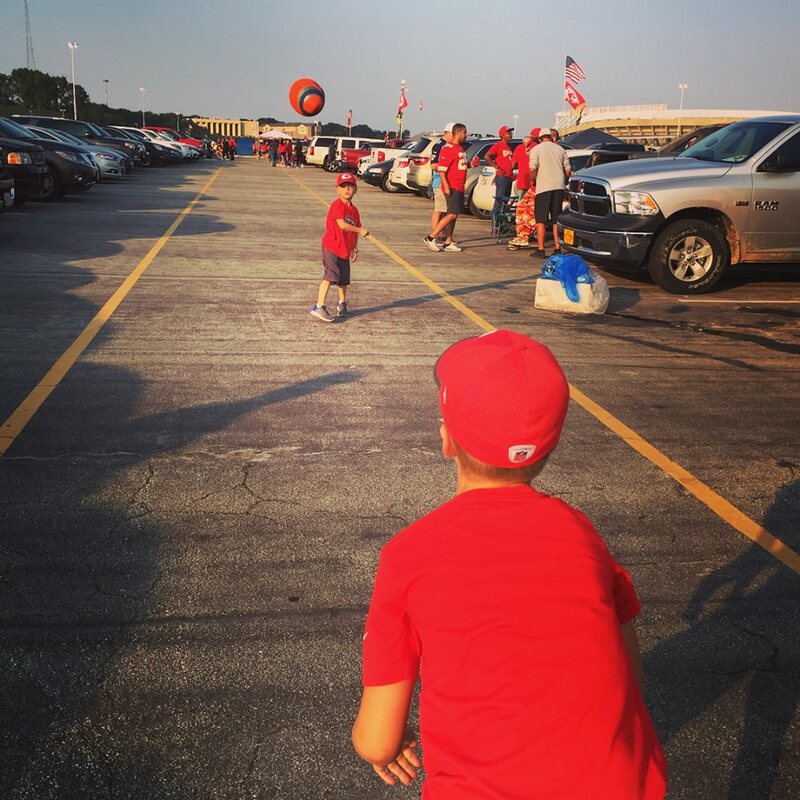 The boys were doing their best "Arrowhead Chop" & dancing along to the beat...all the way out the front gates and to the car.